For your convenience, you can choose currency for prices in the top right corver of web-site. WE ARE HAPPY TO SEE YOU ON OUR WEB-SiTE ! We hope that english translation of our web-site will help you to understand the assortiment of goods wich we can offer you. We are open for international dealers! Our company can help you to get full collection of russain bimetalic 10 rubles commemorative coins. 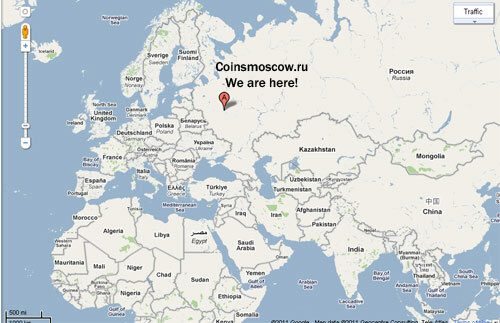 Also we have coins of Poland and Kazahstan wich you can try to sell in your country. If you a collector (not dealer), our internet store is great appotrunity for you to have russain commemorative coins you need. We can not guarantee delivery of your order once it leaves the possession of the Russian postal service. If it gets lost after that point, we can not be held liable. But I can say that it was only one accedent when parcel was lost. Once we receive payment we’ll process the order. After shipping the mail, we will write you tracking number. We don't send goods older 50 years (It is not legal in Russia). We have an official bank account in russian bank VTB24..